PanARMENIAN.Net - If you’ve ever visited Turkey, you will have encountered people you assumed were Turkish but who could well have been Armenian, The Irish Times says in a review of of Avedis Hadjian's book "Secret Nation: The Hidden Armenians of Turkey". Hadjian spent three years travelling round eastern Turkey, the historic Armenian homeland, meeting those mountain people who keep a low profile in a country accused of murdering or deporting about 1½ million of their people. The account of these horrendous times is littered with euphemisms such as “forced migration” or “forcibly minoritised”. Though always denied by Turkey, the word soykurum – Turkish for genocide – encompasses the whole sorry story. Hadjian is part of that story. A journalist, born in Aleppo and educated in Buenos Aires and Cambridge, he bears an Armenian family name and, of vital importance, speaks Hamshetsnak, the almost-forgotten dialect of western Armenia which is now part of Turkey. During his travels, he seeks out people in the villages and towns of that most mountainous part of Turkey, chatting with anyone who will talk to him. Generally, he is welcomed courteously, guided along perilously steep mountain paths, offered lifts from one village to the next often with someone phoning ahead to introduce him. But nearly always there is the denial: No, we’re not Armenian. We are Turkish and we are Muslim. But your name, Hadjian will say having done his research, is Armenian. At this they shake their heads. Maybe many years ago but not now. Some see him as stirring up trouble for them and on one occasion are angry enough for him to beat a hasty retreat. Some Armenians, hoping to pass as Turkish, survived by adopting Islam, freely or otherwise, the latter process known as Islamicisation. Coincidentally, Hadjian introduces us to a bus driver who explains the policy by holding up his index finger: one country, one flag, one language. No room for minorities there. When survival is paramount, the denial of their origins by some Armenians is understandable though Hadjian is puzzled by the reaction of people to whom he has shown documents proving they are Armenian. Many respond with amazement, wanting to know more about their supposed Turkish origins or their suggested Armenian background. And despite the evidence, they maintain that though they may indeed be Armenian they remain Muslim even though before going to the mosque to have Iftar they might deviate to the Armenian Orthodox Church to light a candle or two. Whatever you say, say nothing is the order of the day. 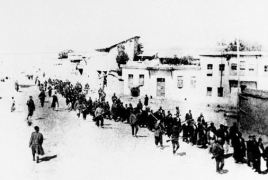 Armenians distrust the Kurds, suspecting they collaborated with Turks to carry out the 1915 Genocide. The Turks see the Christian Armenians as infidels and the Christian Armenians denigrate those Armenians who became Muslim. Distrust casts a shadow over everything. Occasionally, however, Hadjian shines a light into the darkness when Vartan tells his story. Vartan’s Armenian father, orphaned when his family was murdered, was taken in by a kindly Turkish family who brought the child up as a Muslim. Vartan was 25 before he learned he was actually Armenian. But, married to a Kurd, their children Muslim, he lives in a desolate place not of his making: “I feel alone and cold,” he says. For those dispossessed of their past, the Armenia story is one that has yet to reach its ending.